Big meals, graduation deals and more! (SPOT.ph) Graduation deals just keep rolling in and so do markdown promos. The season is celebrated in a big way and by big we mean buffets and group meals + a mix and match combo meal. 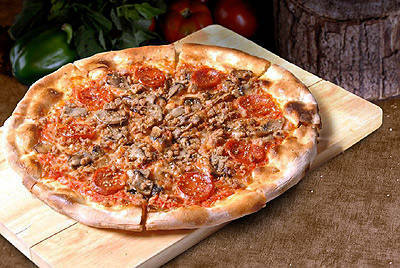 Eat as much as you can at Brickfire. For only P399, get multiple servings of Kansas Ribs, Los Indios Pork, Carbonara. and more. 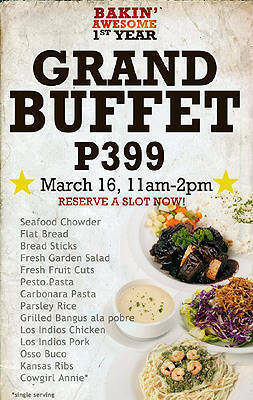 The Grand Buffet is on March 16 at 11 a.m. to 2 p.m. For reservations, call 426-2254. 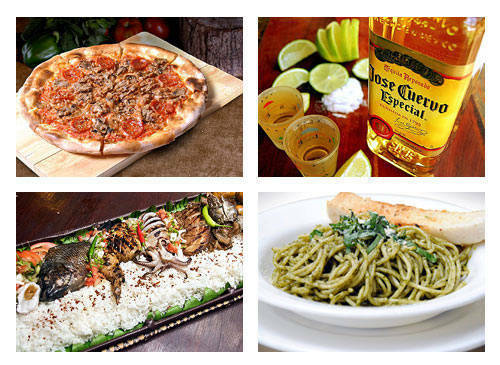 Get your family and barkada to celebrate your graduation at Amici. 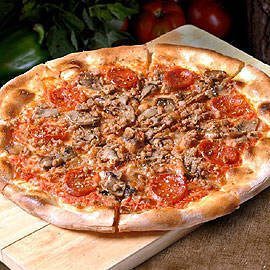 Get a free pitcher of Pepsi when you order two pizzas. 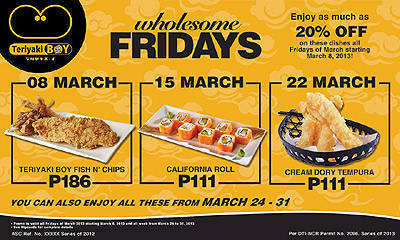 Promo is for dine-in customers only and runs from March 8 to 23. 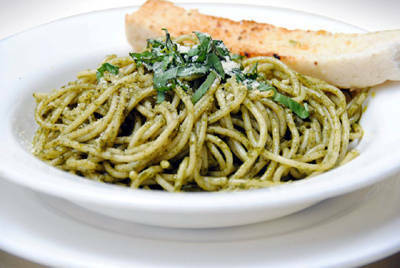 Click here for a list of Amici branches. Bagoong Club is giving a special offer to all 2013 graduates. 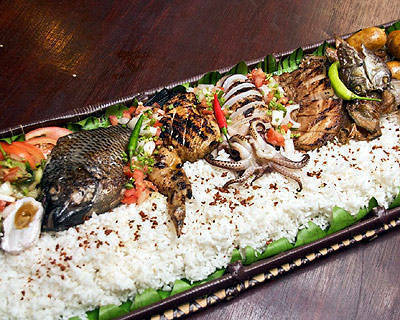 Slash P245 off their Bundat Boodle. Not only will you have a happy wallet, but you will have a happy tummy as well. Promo lasts until March 31 only. 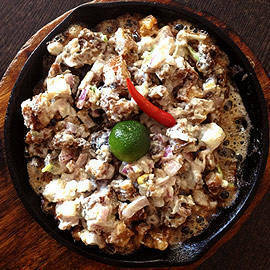 Click here for a list of Bagoong Club branches. Celebrate Hump Day at Big Bad Wolf! 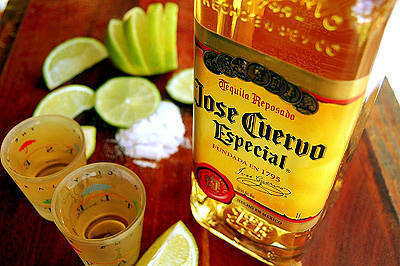 Buy a bottle of Jose Cuervo tequila for only half the price. Ladies can also avail of their 50% off strawberry margarita promo. Big Bad Wolf is located at G/F, Fairways Tower, 5th Ave corner McKinley Road, Fort Bonifacio Global City. Want to treat your friends but don’t have that much cash on you? Go to CPK and avail of their Party for Five promo. 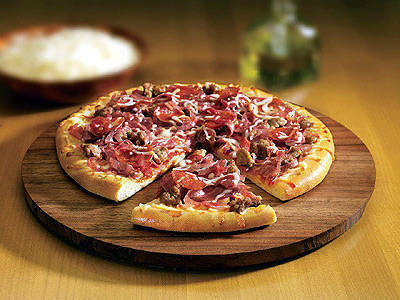 Get pizza, pasta, salad, and a glass of Coke each for only P995 and save as much as P650. Definitely an ideal barkada meal. Promo runs until March 25. Click here for a list of CPK branches. With so many options on the menu, one is bound to say, "Why can’t I have both?" At The Old Spaghetti house, you can create your own rice meal and pasta combo and save a lot. Deal is valid every Monday to Thursday at 2 p.m. to 5 p.m.
Click here for a list of TOSH branches. Visit the selected branches and order your favorite Pancake House meals at a much cheaper price. 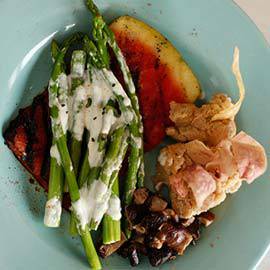 Promo is valid for dine-in and take out transactions only, and is not applicable to steak products and good for sharing meals. Click here for a list of Pancake House branches. Satisfy your hunger with Red Buffalo’s awesome lunch meals. Three (3) pieces of wings, burger steak and country fried chicken meals are each priced at P105, and group meals consisting of 10 wings, pizza, pasta and more for as low as P895. 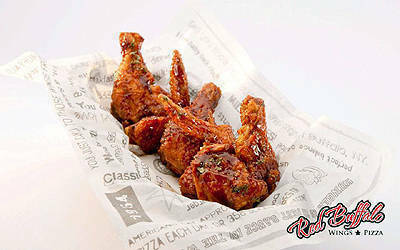 Red Buffalo Wings & Pizza is located at Unit 11 Greenhills Towncenter, #2 Granada St. Brgy. Valencia, Quezon City. Enjoy Teriyaki Boy’s delicious Cream Dory Tempura at a discounted price. Promo is valid on Friday, March 22, and on March 24 to 31. Click here for a list of Teriyaki Boy branches. Summer is just around the corner and Taco Bell honors it with this gargantuan-sized meal. For only P329, get two each of their Crunchy Tacos, Nachos Supreme, Beef Taquitos, Churros and 12-oz. drinks. Click here for a list of Taco Bell branches.